Up early for a shower and brekkie before heading out of Vienna and onto the road to Prague. This is exciting as it has been a huge must see for my whole life. The roads aren’t too bad, except for the fog which makes seeming anything on either side of the road impossible, let alone the cars coming towards you. We bought a Vignette for the car at the border which we had to veer off the motorway to get – there really aren’t any notices other than a small sign to say you are crossing the country borders these days within the EU. We continue on and eventually we come over a hill and there is Prague in front of us, we drive through part of the town where you can already see the wonderful architecture (hmm maybe I should go back to Uni) and headed to Triocamp to park the Motorhome. The camp is managed by Vlastimil Nemec and he speaks wonderful English and provided heaps of information on how to get the tram, buses, trains etc around the town along with a pile of maps. It is getting cold and dark so we set up the van and sit down with a bottle of wine reading up on our maps etc all ready for tomorrow. Up early and pick up our bread rolls from the front counter for cheese on toast brekkie. We then head off to catch the 162 bus which takes us to Kobylisy and then we take the 17 tram which we got off just near the Charles Bridge. Already we love Prague – there is so much to see our heads are on swivel sticks. As soon as we get off the tram and see the massive Prague Castle complex on the hill with the Cathedral, we decide to split the sightseeing into two days instead of one, so today we are off into the Old Town area and leaving the Castle etc until tomorrow. 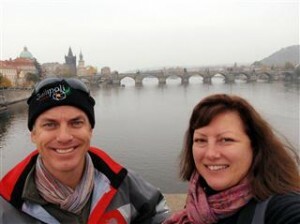 We do however walk most of the way across Charles Bridge which crosses the river Vltava. This has to be one of the most beautiful structures to come across. Dating from the 14th century, Charles Bridge links the castle to the town and although it is now a pedestrian promenade with bands and artists it is also a living art gallery with both sides of the bridge holding about 30 statues. Of course the beautiful gateways at each end are as much a sculpture as anything else and the Old Town Bridge dates from approximately 1357 (designed for Charles IV) and designed by the same architect who drafted the plans for St. Vitus Cathedral which we are seeing tomorrow. The statues are all religious in their nature from Madonna, to St Ives, St Dominic, St Thomas Aquinas etc including a statue of St Christopher, although he is apparently a saint no more and another of St Francis of Assisi. From here we walk back into the Old Town which is full of weaving streets that following the map is almost impossible. There are loads of shops and interesting things going on around up and we head towards Havel’s Market to an open air market full of local products and souvenirs (there are lots of souvenirs shops here in Prague, so don’t think you will run out). It is now getting cold so we stop for a coffee and Scott has a local beer (for the grand price of EUR20, even more than in Florence). Warmed and recaffinated or rebeered in Scott’s case we head off to Wenceslas Square. We pass a bookstore on the way which had a terrific section of English books, but none that Scott wanted and he lamented his lack of Czech. We weren’t sure if we were at Wenceslas Square as it really isn’t a square as such, more a grassed area with a huge statue and groups of kids dancing. So much for being one of the city’s more historic squares. 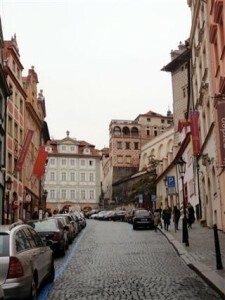 The only good thing is that we didn’t do a city break from London and stay here, much better to stay in the Old Town. We continue walking through the streets to The Globe Bookstore where we hope to browse through some books and have a snack. In the Frommer’s Guide they recommend this restaurant/bookstore a lot. We arrived, sat down, waited, waited and waited some more and then got up and rugged back up again, on our way out the waitress said she was sorry but she was too busy running around!! What a waste of time. We continued back through the streets, now starving and settle for a pizza restaurant – nothing fancy but at least it was hot and there was good service. So far everyone here speaks English as well which is fantastic. We continue back through the streets reaching the Old Town Square and were just in time to see the astronomical clock ring in the new hour. This is a beautiful square full of churches and old buildings and you can easily spend a lot of time wandering through the churches. The Old Town Hall’s Astronomical Clock was built in 1410 and isn’t exactly the most accurate; however the clock at the top of the tower is. 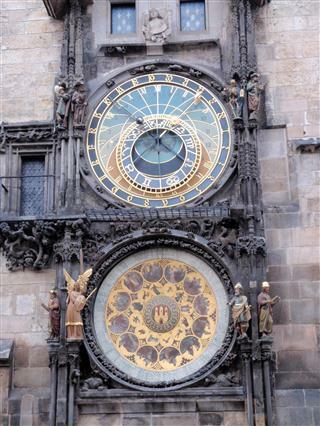 The astronomical Clock is meant to mark the phases of the moon, the equinoxes, the seasons, the days, and numerous Christian holidays. When the clock strikes the hour you are entertained by a variety of doors opening, statues moving and ringing bells and in addition a trumpeter then finishes off the tune. It is now starting to get a bit dark (it is 4pm after all), so we walk back through Josefov which is the home to the Jewish area before boarding our tram and bus back to the campsite. Josefov was once a home to approximately 118,000 Jews, but after WWII only 30,000 survived and now only 3,000 live in this area. Next morning we are up early(ish) and after another filling brekkie of fresh bread rolls we board the bus and tram to go back into Prague. 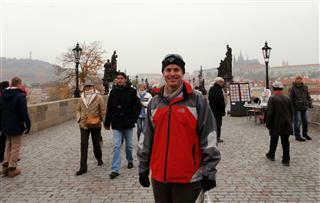 We walk back across the Charles Bridge and up towards the castle complex. This is a lovely walk with loads of restaurants, shops, churches and a whole swag of historical and beautiful buildings. Only a small uphill walk. According to Frommer’s Europe you have to be very fit to do this walk but they recommend a taxi – anybody could do this walk, just take it slowly and enjoy the scenery. We take it slow through the Lesser Town district before we finally reach the hill in Hradcany for a few of the city and wander through the Palace grounds. You don’t have to pay unless you want to go inside, but after seeing the entrance to St. Vitus Cathedral, I quickly go back and buy a ticket. Royal Palace: Since the 9th century this Palace has been the home to the Bohemians and the Vladislav Hall was used to host coronations. There aren’t a lot of rooms, but what is open are interesting and well kept and you also get spectacular views of Prague. It would certainly have been nice to be a royal living here in the day. 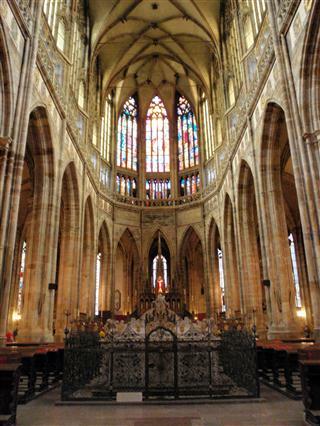 St. George’s Basilica: This is Prague’s oldest Romanesque structure and dates from the 10th century. 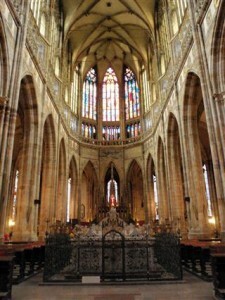 Inside the church is small but beautifully designed and it is plain in comparison to the more grandiose ideals of the cathedral. There is also a great carving on the side entrance of St George slaying the dragon. Golden Lane: This street is a recreation of the houses that were used up until 1952 by castle workers. The houses were originally built in the 16th century and you couldn’t complain about how far you had to roll out of bed to get to your desk. We leave the castle complex and find a more traditional pub/restaurant for lunch where Scott enjoys a giant port knuckle with potatoes and cabbage along with a beer (Pilsner Urquell and Staropramen), I settled for an omelette, oh the woes of being vegetarian and standing strong in the face of such weakness. We head back across Charles Bridge which is now much busier than earlier and back into Old Town. Scott is on the hunt for a traditional Pilsner glass so that becomes out mission. After all Pilsner started here. Eventually after much walking and almost giving up, we found one, so happily we can head back to Vinnie as it is getting dark and cold. We can honestly say that Prague is one of the best cities we have visited and gives Istanbul a run for its money.